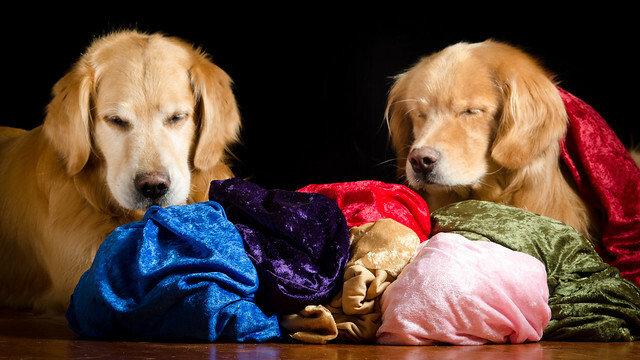 Guys, could you fold up the backdrop fabrics for me? Zachary: "Ok Henry, get started. I'll supervise." 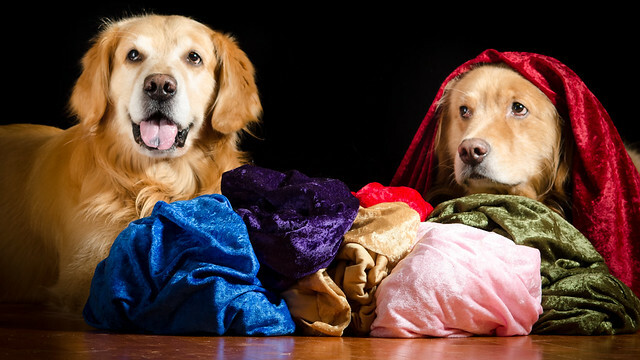 I asked the boys to fold a pile of backdrop fabrics for me. Probably not one of my wiser decisions, although I do admire their enthusiasm. Daily Dog Challenge 1728. "Full of Color"
Our Daily Challenge - July 24, 2016 - "Lots and Lots of Color"
This is most (but not all) of my assorted colors of Crushed Panne Velvet. 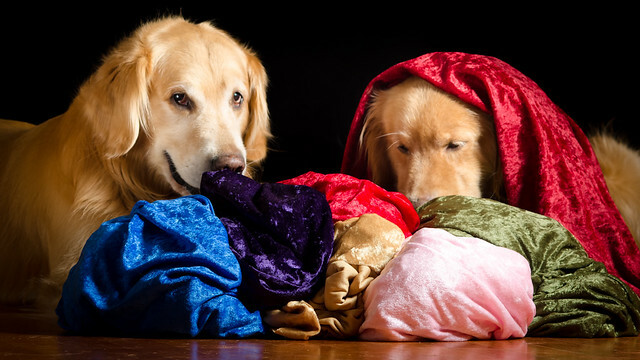 It's an inexpensive (regularly ~$6/yd but it goes on sale frequently), washable, indestructible, non-wrinkling fabric that is often used as a cheap velvet substitute for costumes. Missing are a hideous blue-green color, which clashes with the boys golden fur, plus a white and a cream that are great for high-key shots but would have stood out too much here. Off the top of my head, I've used these for backdrops, pillow covers (large and small), capes, a giant santa bag, a hat cover, table clothes, blankets, and stage curtains. I've never actually sewn it as you can do wonders with safety pins, rubber bands, and binder clips, and then shake it out when you are done and it's as good as new. "I wish I may, I wish I might..."
Sorry guys, I don't think you can wish the fabrics folded. At least that never works for me.